The theme for 2014 is “Growing our history for a stronger tomorrow.” As I have stated many times, we write our own history! By taking an active role in determining the future of your Grange, you are “Growing our history” and creating a “stronger tomorrow” for our great organization. Join me in rededicating ourselves to creating a stronger Grange for generations to come. The theme for 2013 is Leadership Through Service; Growth Through Action. Growth is essential to the long-term and short-term success of this organization. I challenge every Grange in Connecticut to increase their membership by 25% in the 2013 Grange year. Growth in these numbers is no longer an option, it is essential for our survival. 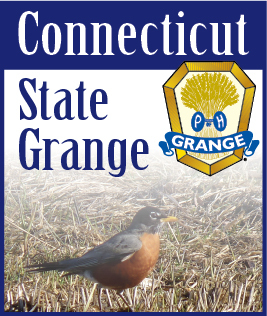 The departments and committees of the Connecticut State Grange stand ready to provide you with tools needed to nurture leadership and membership growth. 2012 brings us a great opportunity to focus on Pomona Granges while continuing our Growth in each Community Grange. By strengthening our Pomona Granges we ensure a more solid support system to each Community Grange. • GROW Membership, reorganize 2 Community and organize 1 new Junior Grange. “Community Grown” is the 2011 Grange year theme. As a grass roots organization our influence and positive impact is best felt in the individual communities our Granges serve. As we look ahead to the 2011 Grange year let us always remember with pride our opportunity and ability to change the landscape of our communities and improve the lives of our neighbors for the better through our programming and community service. As we go forth into our communities let us remember our salutation and what we are, COMMUNITY GROWN! Now is the time to look to the future of our fraternity. We have built a strong foundation for our organization for more than one hundred years. That foundation has been our strong support of agriculture and rural America coupled with our increasing emphasis on community service. We must now build on that foundation to increase our membership. Opportunities present themselves at times, we must seize the opportunities and try different and exciting ideas to improve our programs and move our Granges ahead into the future. Find innovative ways to increase participation of your inactive members. They are part of our foundation and use these new ideas to interest prospective members to join your Grange. Keep all members active with different and exciting projects. Have educational and entertaining programs. Enjoyable meetings are a cornerstone for increased attendance. Remember our Mission Statement and inculcate it in all the work that we do. Working together we can accomplish new heights for our Granges and enjoy our success well into the future. Now is the time to look to the future of our fraternity. For over 100 years we have built a strong base. That base includes our strong support in Agriculture and our increasing emphasis on Community Service. We must now expand on that base to increase our membership. Now is the time to try new and exciting programs to push our Granges forward and build on the strong base we have established. Bring inactive members back and give prospective members a reason to join your Grange and remain active by trying new programs in your community. Remember that Community Service has always been one of the building blocks of our Fraternity. Have interesting and unique programs to attract new members. A second building block has always been interesting and educational programs. Inculcate the Mission Statement in your work and make your activities and meetings interesting. Build on Our Base to improve your Grange, should be the mantra of all our members. We must all work together to bring our Grange to new heights and success. Brothers and Sisters we need to challenge one another to take our organization to new heights. We have been content with the successes over the years by doing the same programs in our Granges, having the same work projects and performing the same community service projects. Now is the time to try new and exciting projects to push our Granges forward and make them even more successful. Bring inactive members back and give prospective members a reason to join your Grange and remain active by trying new programs in your community. Involve community leaders in the planning of new community service projects. Remember that many hands make light work and that having many people involved leads to interesting and fun projects. Inculcate the Mission Statement in your work and try something new and challenging. Take the Road Less Traveled to new experiences in your Grange Life and bring your Grange to new heights of success. Brothers and Sisters we need to follow up on last year's program "Building a Bridge to the Future" and move our organization forward. This can only be accomplished if we all work on growing the Grange and bringing in new members. We re at a turning point of our Order and if we don't move forward we will watch as it goes by the wayside. Let's forget the excuses of the past and accept them as opportunities for the future. The road starts on last year's bridge and looks forward to the future with our new mission statement as our road map and compass. We must all try new ways to bring in members and keep our organization viable. Community Service can be the tool to make each Grange stand out in its community. Get involved in local issues and push legislation to benefit your town. Also remember to sponsor family activities to emphasize we are a family organization. That is where our mission statement leads us.